Fishermen have been wearing ganseys (Guernseys) since about the start of the 17th Century - the design is said to have been developed in the Isle of Guernsey, just the same way that the term jersey originated from the neighbouring Channel Island of Jersey. Ganseys were knitted in un-oiled, soft, round, dark-blue 4 ply wool on four size 14 needles to make a firm, close fabric that was almost wind and waterproof. They were one-piece garments. A split had to be made at the underarm, the back and the front then being joined on the shoulders with a decorative bar about an inch wide. This shoulder bar was retained even when fashions changed and plainer type patterns were introduced. The sleeves were knitted from armhole to the wrist, there being no sewing anywhere. Repair was therefore easy since it was no problem to pull out a ragged cuff and re-knit the repair area. The ganseys that were worn by the fishermen were always hand-knitted but there were no written instructions, the designs being copied from existing garments and, in the case of unique design patterns, developed by the womenfolk themselves and passed on to daughters and relations. Some traditions state that a drowned man could be identified by the pattern on his gansey. The gansey came into its own around the late 18th and 19th centuries when fishing boats followed the great shoals of herring that appeared round the coasts. Women moving from port to port copied each other’s designs and could even copy a pattern seen being worn by a stranger in the street. The designs were simple geometric shapes and were often given nautical names e.g. herring bone, anchor and flag etc. The womenfolk made their own variations even to the extent of incorporating, or alternating, two designs into the same garment. When the number of patterns was investigated, it was found that there were twelve basic patterns but that each was capable of infinite variation. Each man possessed four, or even five, ganseys for general use but habit dictated that one guid gansey was kept for going ashore or away from home, or even for the Kirk on Sundays. By the early 1930s, patterns began to disappear and plain ganseys became the fashion. Gradually, other colours rather than the navy-blue took over, especially among the younger fishermen. 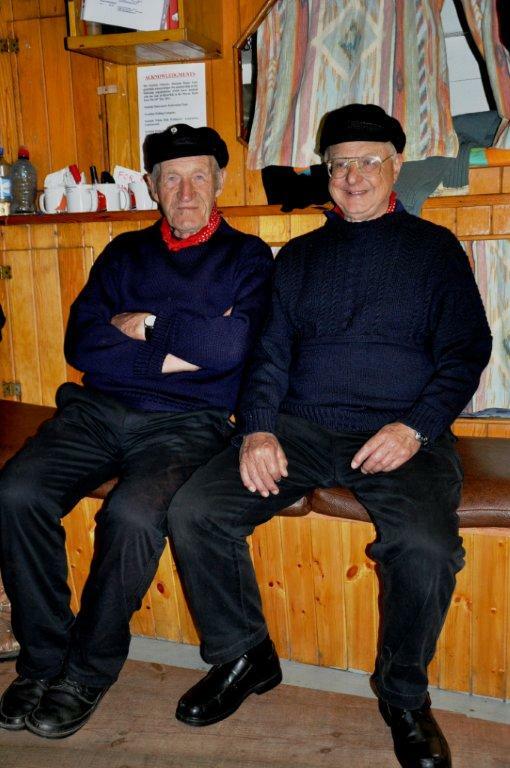 It wasn't to be long before the wearing of ganseys was confined to the older fishermen, whilst the younger men took to wearing pullovers.